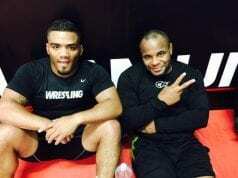 Daniel Cormier believes that his good friend and fellow AKA training partner at Cain Velasquez will be a champion again. The former UFC heavyweight champion has his next fight lined up, and it’s a big one. Velasquez vs. Francis Ngannou will headline this weekend’s UFC on ESPN 1 event. 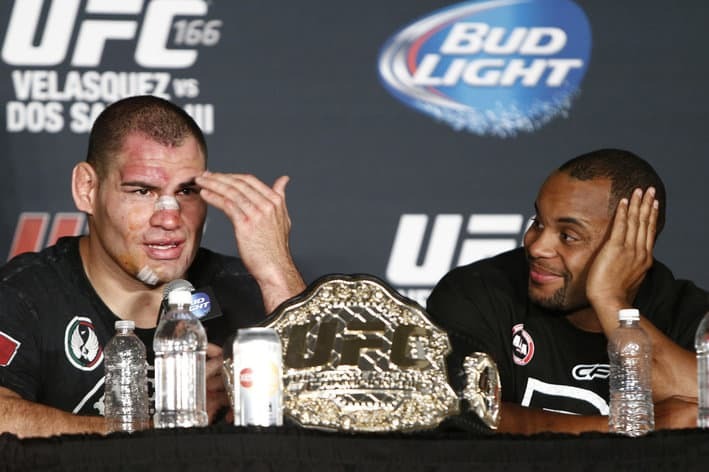 It’s been some time now since we last saw the former UFC heavyweight champion face elite fighters in the division. Velasquez was unable to compete in 2017 and 2018. If you recall, he was supposed to fight fellow former UFC heavyweight champion Fabricio Werdum in December 2017 but he had to pull out of the bout due to a lingering injury in his back, which ultimately required surgery. During a recent appearance on The MMA Hour, Cormier made it known that once he retires and relinquishes the UFC heavyweight strap, Velasquez will take over as king. “He will be the champ, very, very soon. As soon as I’m out of there he will be the champ,” said Cormier (H/T to MMAMania). “The only issue with that is, the UFC has to know, now Cain is healthy and they can trust him because he will be around for a while.”UFC on ESPN 1 is set to take place on Sunday, February 17, 2019 at Talking Stick Resort Arena in Phoenix, Arizona.